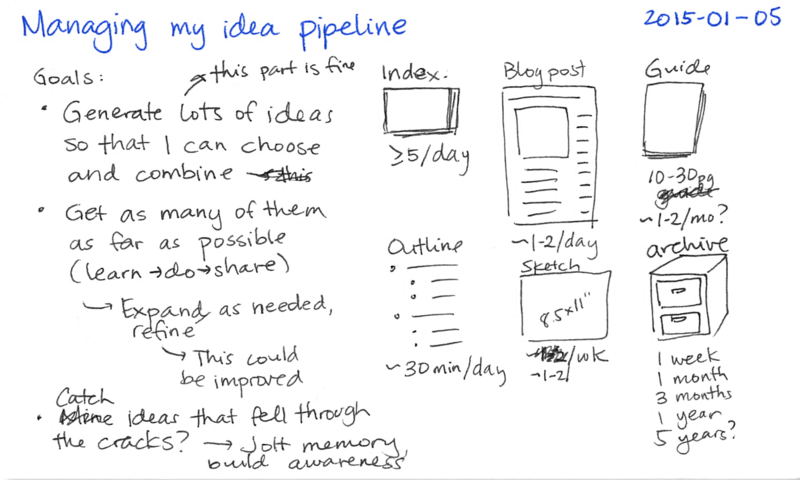 When people are starting out with sketchnoting, it’s helpful to remember that sketchnoting’s about “ideas, not art” (as Mike Rohde says in The Sketchnote Handbook). 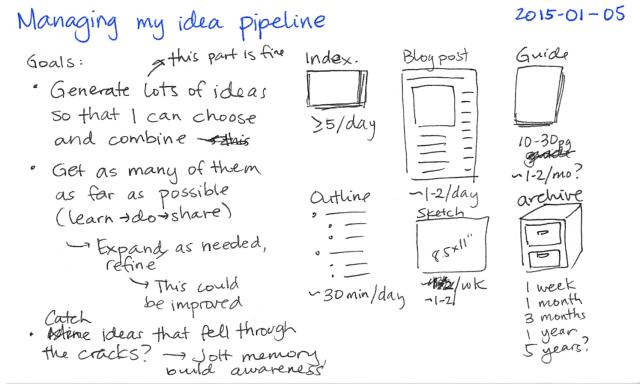 It’s easy to get intimidated by the visually-impressive sketchnotes people post, so the reminder is useful. 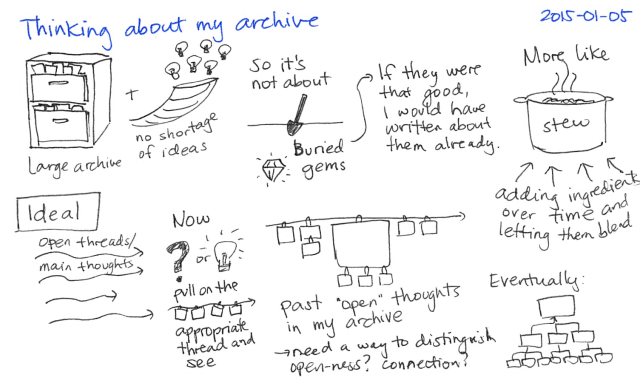 I’ve been using sketchnotes to explore my own thoughts instead of recording other people’s content. I like flipping things around, so that got me thinking: What can I learn from the way artists work, and how can I apply that to learning and drawing? Collect: Artists collect inspiration. They fill sketchbooks, make moodboards, clip reference photos, and so on. Emulate: Artists develop their skills by emulating masters. Observe: Artists draw what’s there, not what they think is there. They also analyze the techniques other artists use and the effect of these techniques on the piece. Imagine: Artists aren’t limited to what they see. They can draw what isn’t there. They can draw the essence of a thing. Transform: Great art transforms the way people see. Experiment: Artists try different techniques and styles to figure out what works for them. Craft: Artists refine their work and improve their tools. Sketch: Artists do quick studies to try several views or focus on different aspects before making the commitment of paint on canvas. I was particularly curious about this idea of making studies or sketching things in order to experiment with different views or to focus on small parts before composing the whole, so I dug into that further. When I start with a large sheet, I sometimes peter out halfway through because I’ve dug to the bottom of that idea (at least for now, with the tools and time I have). If I work with large sheets, it’s not as easy to keep all the relevant ones in view at the same time. I need to summarize more frequently. I often zig-zag between topics, leaving sheets unfinished. Half-sheets are awkward to post. 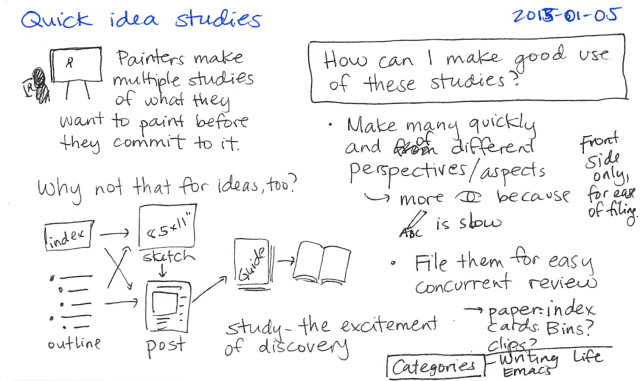 Using index cards for “studies” of an idea might be a useful technique. Each card is a small chunk, quick to capture, complete in itself, and yet linkable with others. The cards are easier to rearrange. If each card represents one idea or summary, I can keep more ideas in view. There are trade-offs, naturally. Sometimes the desire to fill a large sheet makes me to sit with a question longer, letting me discover more. Large sheets gives me the ability to draw and describe relationships between ideas. If I have many small chunks, I need to invest more time in summarizing and filing in order to make the most of them. Artists might make studies in preparation for a specific work, or they might make studies just because. 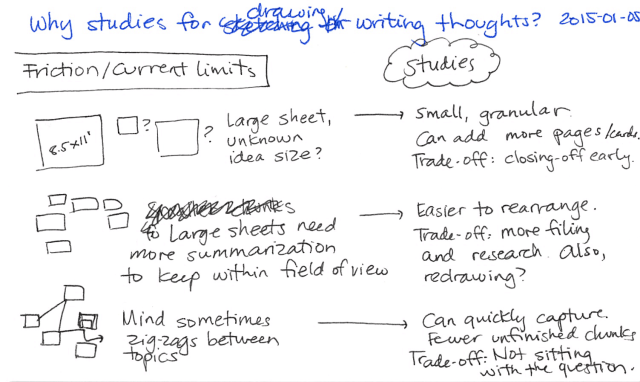 If I have a specific question in mind, it’s easy to sketch my way around the topic and then organize those thoughts into a whole. I’m not as good at managing fragments over an extended period of time, although I’m getting better at linking to and building on previous blog posts. 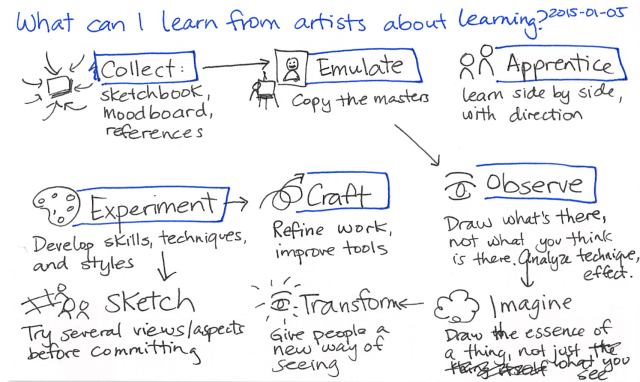 What can I learn from the way artists keep working on something? Artists might work on a piece for weeks or more, keeping it visible on an easel, taking a step back from time to time, looking at it in different light. They might have several such pieces on the go. I still prefer publishing early instead of waiting until something is a masterpiece. Feedback is great, and even small chunks can be surprisingly useful. If I improve the way I manage my studies, though, I might get better at refining ideas. I think it’s like the way an artists might clip photos or sketch things that have caught their eyes, and then return to that inspiration years later when they think of something that needs it. 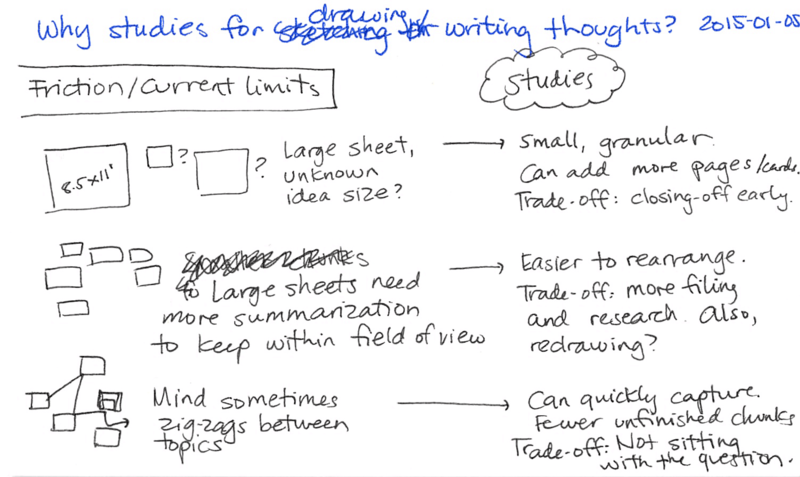 Speaking of archives: I’ve written about index cards before as a way to develop thoughts (2014; much like this post), plan my life (2007), and prevent boredom by writing (2005!). I haven’t quite mastered this yet, but I’m getting somewhere. What can I add to this based on this reflection on artists? I don’t do enough zoomed-in focus or variations on a theme yet, I think. Studies aren’t just about capturing the gist of a thing so that you can reproduce it later in your studio. They let you minutely observe a specific aspect, and they let you experiment with different ways to portray something. What would that look like, if I could do it really well? For observation, I might have index cards that focus on sub-topics, like the way I’ve built up this post from the sub-questions in the illustrations. For variety, I might experiment with visual vocabulary and metaphors, improving my creative expression. There’s also something to be said about sheer practice in exploring thoughts, like the way artists might sketch for sketching’s sake. James Altucher recommends coming up with ten ideas a day (also related: his post from 2012). I’ve been experimenting with setting myself a minimum of five index cards a day. I write the dates for all of them before I start on the first one so that the desire to fill in the blanks pushes me to complete all of them. This usually leads to even more cards as the first set of ideas sparks more questions. Actually, the challenge isn’t generating ideas. Artists never run out of things to sketch – they can look around and find more! I have an archive of ideas I haven’t exhausted and a cornucopia that generates more every day. What would masters of this be like, and how can I emulate them? I think of Leonardo da Vinci’s studies, asking and observing. I think of writers who name and describe things, and in so doing, they help me see better – the way the light behind an object separates it from the background. I may never draw or write a thousandth as well as they do, but I can grow through emulating the way they slow down and pay attention, the way they turn things over and over instead of rushing on.